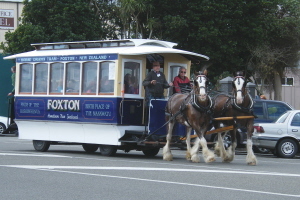 Foxton Horse Tram Society Inc.
Driving heavy horses is an art held by an ever-diminishing number of people. 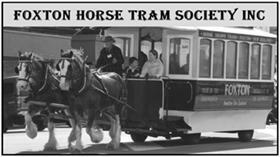 Volunteers operate the tram and look after the horses. We are always on the lookout for drivers who can help us maintain this attraction. If you, or somebody you know, is able to drive our tram and is willing to help, please contact Jim White. 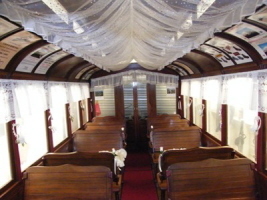 The tram, horses and equipment were purchased in 1988 from Garry Coster in Dunedin. Garry had assembled these under the sponsorship of Speights Brewery. Built on a truck chassis this replica of an 1800's tram is both new and old. The exterior is constructed with fibreglass, while the interior contains the same timber work as used in original contructions. 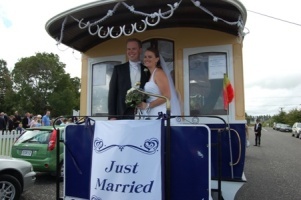 During its years in Foxton, the tram, horses, harnesses and necessary support items have gone through several changes with repainting and refurbishment as required. Today you may see our transport truck towing the Tram to other venues. On board will probably be 3 horses, plus the necessary supporting harness etc. The horses used to pull the tram are Clydesdales named Holly, Katie and Cloud. When not in operation the tram can be seen through the internal windows of the Station Tea Rooms, 100 Main Street, where it is stored in a purpose built shed. The tram operates on weekends, usually Sunday, weather permitting, when volunteers are available, and at other times by arrangement. Driving heavy horses is an art held by an ever-diminishing number of people. Volunteers operate the tram and look after the horses. We are always on the lookout for drivers who can help us maintain this attraction. If you, or somebody you know, is able to drive our tram and is willing to help, please contact Jim White.